A new initiative for every Biola University graduate to have a cross-cultural experience, and increased student interest in studying abroad, has caused Biola to emphasize and increase study abroad programs this year. Due to growth in recent years, study abroad programs has partnered with Biola’s Center for Cross-Cultural Engagement (CCCE) to create more opportunities for Biola students to experience life beyond the campus’ cultural frame of reference. The study abroad program started at Biola in the 1970s in partnership with the Council for Christian Colleges and Universities (CCCU). Starting with the American Studies Program in Washington, D.C., associate director of the CCCE, Amy Agadoni claims that in the last ten years the demand for study abroad programs has increased. Today, Biola offers 28 opportunities around the globe through which about 270 students are able to study abroad each year. Biola aspires to cultivate competent and courageous graduates and build a cross-cultural Christian community through the programs they offer such as study abroad. What Agadoni views as a “life-long learning experience that will be woven throughout the students’ life,” the study abroad program desires to foster a love for learning and a deeper understanding of other cultures. “With the aspiration of cultivating competent and courageous graduates, when students then graduate and have it [study abroad experiences] on their resume and in their vocabulary, they are able to articulate this experience that they had,” said Agadoni. The CCCE desires to help students better communicate their thought processes before and after they study abroad. In doing this, the students will be able to use their experience as a tool when entering any professional field of work. Junior at Biola, Timothy Elliot, has seen how his experience of studying abroad has strengthened his professional integrity. “I have grown a lot in the areas of perseverance, overcoming adversity and independence, as well as the confidence that comes with finishing a study abroad experience,” said Elliott, who studied with the Uganda Studies Program in the fall of 2014. The study abroad program is one of the most tangible ways a Biola student is able to have a cross-cultural experience. The program has opportunities spanning from Los Angeles to England, Ecuador and China. “It’s important for Biola students to understand cross-cultural engagement and to understand the depths of diversity … to understand the thought process and the cultures of others that are different then they are,” said CCCE director Gail Buck. In providing a chance to study abroad, Biola seeks to better prepare students to engage the world around them. “We are here to spread the gospel, so that’s why it’s truly important, and to have it [cross-cultural engagement] embedded into the University Plan is phenomenal, and better yet … to have action,” said Buck. Having taken more students this past semester than any other, Biola London is one of the most popular study abroad programs Biola offers. In the fall of 2013, it took its largest group thus far of 27 students. 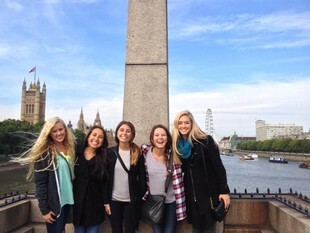 Junior Haley Wilson shared her thoughts on her cross-cultural experience studying in London. “Getting to know people who are different and visiting new places helps me better understand the character of God, and challenges me to know what I think and why,” said Wilson. With the increased focus on cross-cultural engagement, the CCCE is developing and seeking to increase awareness of and participation in study abroad programs by converting to a fully electronic application that will speed up the process and allow more students to apply. This tool is expected to launch in the fall. There is also discussion about creating a general education program targeting sophomores that will allow students to potentially fulfill several class requirements through the study abroad program, including Spanish, literature, Bible, anthropology and philosophy. For more information about study abroad programs, please visit the website or contact Gail Buck at gail.buck@biola.edu.